The Wildkat Royale’s innovative design starts with a solid piece of warm, sustain-rich mahogany that is computer-routed to create an acoustic guitar-like body except with a “center block” area like an ES-335. 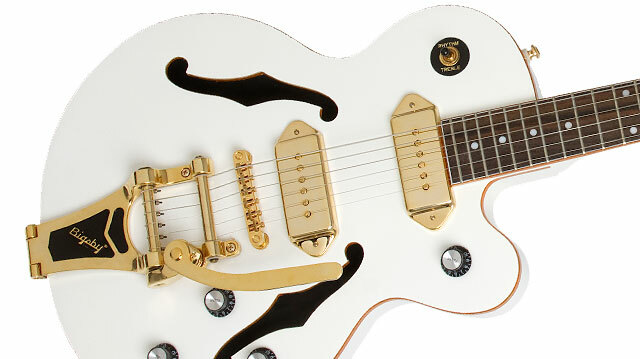 The body is then covered with a beautiful pearl white finish with gold sparkle binding and gold hardware to create a semi-hollow body masterpiece. The Wildkat Royale’s mahogany body is matched with a hand-fitted, glued-in solid maple neck for maximum tone and sustain. 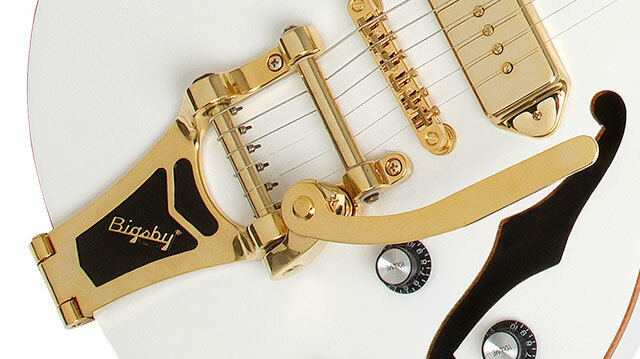 The Wildkat Royale comes with an authentic gold B70 licensed Bigsby® vibrato for even more sonic versatility. The vintage voice of this ‘Kat comes from a pair of Epiphone gold "dog ear" P- 90 Classic pickups specifically designed by Epiphone. Other appointments include the historic metal Epiphone name “badge” on the headstock as well as a unique control configuration of 1-bridge volume, 1-neck volume, 1-master tone and 1-master volume. These controls are powered by Epiphone’s full-size 1” 500K ? 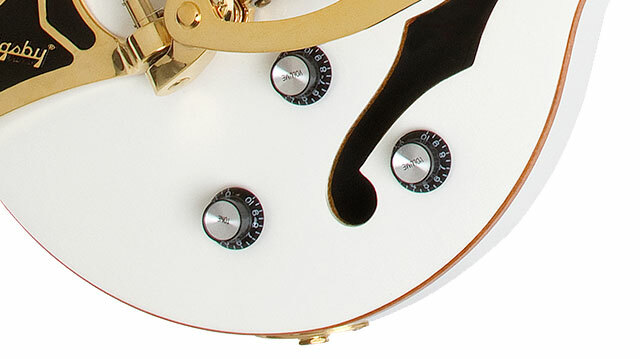 potentiometers and matched with Epiphone’s superior all-metal toggle switch and heavy-duty output jack. The Wildkat Royale also features premium 18:1 Grover® machine heads for superior tuning stability. All of this great design comes together with fabulous vintage semi-hollow tone and great sustain plus, being slightly larger than a Les Paul and smaller than an ES-335 size, it's lightweight and really comfortable to play!